Moscow Victory Parade of 1945, June 24. The Moscow Victory Parade of 1945 (Russian: Парад Победы, tr. Parad Pobedy) was a victory parade held by the Soviet Armed Forces (with the Color Guard Company representing the First Polish Army) after the defeat of Nazi Germany. 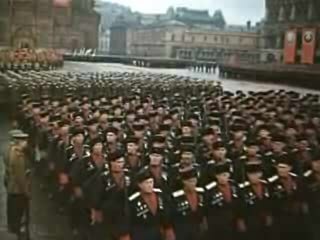 This, the longest and largest military parade ever held on Red Square in the Soviet capital Moscow, involved 40,000 Red Army soldiers and 1,850 military vehicles and other military hardware. The parade lasted just over two hours on a rainy June 24, 1945, over a month after May 9, the day of Germany's surrender to Soviet commanders. To mark the victory over Germany in the Great Patriotic War, I order a parade of troops of the Army, Navy and the Moscow Garrison, the Victory Parade, on June 24, 1945, at Moscow's Red Square. Marching on parade shall be the combined regiments of all the fronts, a People's Commissariat of National Defense combined regiment, the Soviet Navy, military academies and schools, and troops of the Moscow Garrison and Military District. My deputy, Marshal of the Soviet Union Georgy Zhukov will be the parade inspector. Marshal Konstantin Rokossovsky will command the Victory Parade itself. I entrust to Col. Gen. Pavel Artemyev, the preparations and the supervision of the parade organization, due to his concurrent capacities as the Commanding General of the Moscow Military District and Commanding Officer in charge of the Moscow City Garrison. 1. In order for the front to participate in the Moscow City parade in honor of the victory over Germany, each front will be represented by a combined regiment which is to be raised among them. 36 color bearers and 4 escorting officers. All in all the regiment will be composed of 1,059 male active personnel and 10 additional reserve personnel. and 1 combined company (composed of cavalrymen, sappers and signalmen respectively). 4. The companies in attendance will be manned so as to have the middle-ranked officers commanding the squads, which are then composed of privates and sergeants. and the combined cavalry, signals and sapper company also with slung carbines and with sabres for the cavalrymen in attendance. 6. The Front Commanders and all commanders including air and tank army commanders will arrive in Moscow for the Parade. 7. On June 10 of this year, the combined regiment of the front will arrive in Moscow having 36 combat colors from selected Front units that are the most distinguished in action, and all the captured enemy standards, whatever the number, selected to be carried in the parade proper. 8. The full dress uniform will be issued in Moscow for use on the parade by the regimental staff. Marshals Georgy Zhukov, who had formally accepted the German surrender to the Soviet Union, and Konstantin Rokossovsky, rode through the parade ground on white and black stallions, respectively. The fact is commemorated by the equestrian statue of Zhukov in front of the State Historical Museum, on Manege Square. Zhukov's stallion was called Кумир ("Idol"). The General Secretary of the Communist Party of the Soviet Union, Joseph Stalin, stood atop Lenin's Mausoleum and watched the parade alongside other dignitaries present. According to certain editions of Zhukov's memoirs, Stalin had intended to ride through the parade himself, but he fell from the horse during the rehearsal and had to yield the honor to Zhukov, who used to be a cavalry officer. However, this story is disputed by former Soviet spy Viktor Suvorov. He claims that the story was inserted into Zhukov's memoirs as a counterargument to his theory, (although it apparently was in circulation earlier) that Stalin didn't lead the parade because he considered the war's results not worthy of the effort invested. Suvorov notes several inconsistencies in the story, along with numerous evidence that Zhukov was intended all along for the role of leading the parade; for example, the memoirs of Sergei Shtemenko, the man responsible at the time for the preparation of the parade, state that the roles were decided from the start, and Igor Bobylev (who took part in the preparations) claims that the story never happened and that Stalin never visited the Manege at that time. Displays of the Red Army vehicles were some of the focal points of the ceremony. One of the most famous moments at the end of the troops parade took place when various NKVD soldiers carried the banners of Nazi Germany and threw them down next to the mausoleum. One of the standards that was tossed down belonged to the LSSAH, Hitler's personal bodyguard. Due to the bad weather that day the flypast segment and the planned civil parade were cancelled; if the weather had improved, the flypast would have been led by Chief Marshals of Aviation Alexander Novikov and Alexander Golovanov. Nonetheless, this historic two-hour parade remains the longest and largest military parade in Red Square's history, and involved 40,000 soldiers and 1,850 military vehicles and other military hardware. First Ukrainian Front in Victory Parade. OMSDON 1st NKVD Internal Troops Mechanized Rifle Division (Special Duties) "Felix Dzerzhinsky"
^ Святое Дело (in Russian). Viktor Surorov. Retrieved 2011-07-17. ^ Последняя Республика (in Russian). Militera.lib.ru. Retrieved 2011-07-17. Wikimedia Commons has media related to 1945 Moscow Victory Parade. This page was last edited on 6 April 2019, at 03:17 (UTC).